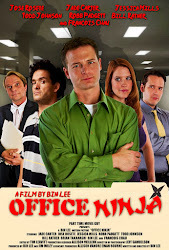 The award-winning comedy starring Jade Carter (JAG), Jose Rosete (Age of Dinosaurs), Francois Chau (Lost), Jessica Mills (Awkward Embraces), Robb Padgett (Vampire Zombie Werewolf) and Todd Johnson (Mortal Kombat: Rebirth). Now on Amazon and Vimeo! Here there! No new Office Ninja video per say... but you can check out Robb Padgett joining Ed Robinson in Bin Lee's first ever PTMG podcast! Part Time Movie Guy LLC 2011. Simple theme. Powered by Blogger.